Hard Wired components in The Division 2 are items that drop from specific missions. You need the Division 2 Hard Wired components to complete a certain project, among other things. The game does list which missions you can get the components from, but it does remove it at some point, potentially leaving you in the dust. 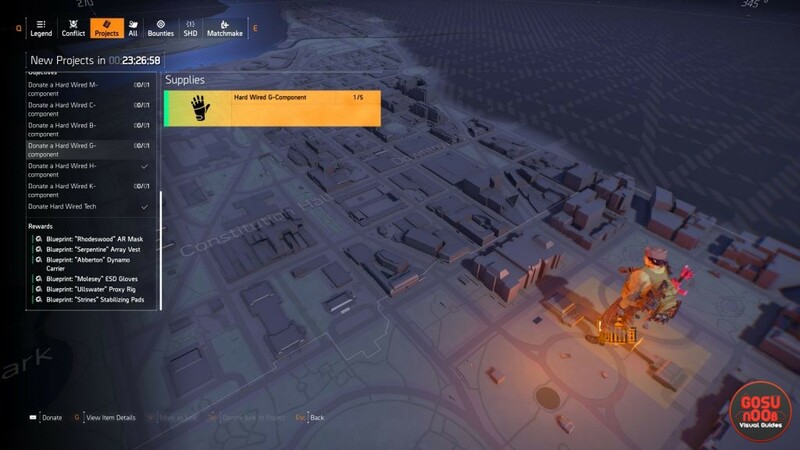 So, here’s our Division 2 Hard Wired Components Locations guide to show you which missions drop which Hard Wired component. How to Get Hard Wired Components in Division 2? To get Hard Wired components in The Division 2, you’ll have to play the missions that drop said components. The game lists which components drop from what mission, but you might’ve missed it. Before we dive into that, though, a few opening statements. From what we can tell, it doesn’t matter which difficulty you complete the missions on; even playing on Story difficulty seems to reward you with the allotted component. Which, of course, doesn’t mean that you aren’t going to get any components on the higher difficulties. However you want to do it, it’ll pay off component-wise, basically. Okay, here goes. First off, the M-Component, which is the Mask. It drops from the Grand Washington Hotel mission. Then, we have the C-Component, which is the Chest, and that drops from the Jefferson Trade Center. The Hard Wired B-Component (aka the Backpack) us in the Federal Emergency Bunker. G-Component, or the Gloves, drops from the Lincoln Memorial, The Holster, or the H-Component, drops from the Air and Space Museum. Last, but not least, the K-Component, or the Kneepads, drop from the Bank Headquarters. If you need further help concerning the new content in The Division 2 that has come with the Tidal Basin update, you can check out some of our other guides on the matter. Among others, we’ve got How to Replay Invaded Stronghold Mission, Nemesis Exotic Marksman Rifle – How to Get, and T-Rex Keychain Backpack Trophy Location. Joe likes to talk about himself in the third person. Joe has no idea what you’re talking about.